Being a child of the 1980s, I grew up during the first Teenage Mutant Ninja Turtles craze. I liked the (literally and figuratively) colorful characters and outrageous catchphrases the \'heroes in a half shell\' used to spout off, even if they did sound a little corny. I also felt a special connection to the characters (I was young, okay?) because I, like the turtles themselves, absolutely loved pizza. TMNT was a pop culture phenomenon back then, with toys, cartoons, comics books, lunchboxes, movies, and kitchen sinks named after them (okay, so maybe not that last one). Oh, and let\'s not forget the videogames that starred the little green guys: The 8-bit Nintendo Entertainment System, the arcades, and the two 16-bit contenders -- the Super Nintendo and Sega Genesis -- all had at least one licensed TMNT game released for them. My personal favorite in that bunch was Konami\'s arcade beat \'em up, which I felt captured the spirit of the characters and the original cartoon (but not the comics by creators Kevin Eastman and Peter Laird...those were much darker, surprisingly). Today, \'80s nostalgia has resurrected yet another franchise, as the pizza-lovin\' green freaks have a new cartoon, new toys, and a new monthly comic. Oh, yeah, and a new videogame. What\'s interesting is that this game is modeled after the original arcade game; indeed, it\'s produced by the same company, and a couple of the designers of that game actually worked on this one. So, has Konami given us a worthy addition to the TMNTbrand, or just a hacked-out licensed game rehash? Visually, the game is quite impressive. The cel-shading techniques employed by Konami fit the title well, and there are some neat explosion/screen warping effects used in the game. As for the character models, they\'re simply done, but they animate fluidly and are generally well-designed. The turtles themselves, Casey Jones, April O\'Neil, and Splinter all look decent, as do the Foot Clan ninjas and assassins. However, the monster and robot designs are rather generic and devoid of personality, as are the Purple Dragon Gang members in the beginning of the game (the only human enemy designs I didn\'t care for). The backgrounds are mostly forgettable (standard city streets, sewers, abandoned construction sites, museums, Japanese gardens, etc), except for a futuristic lab in one of the later levels. On a more positive note, the framerate is very stable. Now, being that this game is based on the new cartoon (which is not nearly as cool as the old one, in my opinion), Konami has inserted some fully-animated cutscenes into the title. These are well done, but it\'s standard Saturday morning cartoon fluff \'n stuff. It\'s not exactly DVD-quality, either, as the video seems to be a bit choppy. Oh, and if you see an in-engine cutscene (using the game\'s 3D cel-shaded graphics), there\'s no lip-synching! How hard would it have been to add that, anyway? Kinda sloppy, if you ask me. When it comes to sound, this game falls flat on its face. The voice actors are all from the current cartoon series, but they don\'t do much to enhance the game\'s audio. In fact, everytime you attack someone, your chosen turtle yells out a \'cool\' catchphrase, such as, \'Anyone for some stickball? I have the stick, you be the ball!\' or \'Outta my way, nimrod!\' Ain\'t it cool, kids? Um, nope, it\'s irritating, especially after you hear it a thousand times (and trust me, you will). 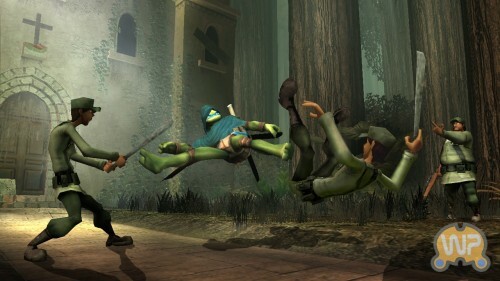 I nearly screamed \'Why don\'tcha just shut up and hit the blasted ninja, ya little green freak!\' at my TV at one point. I doubt that\'s the reaction Konami wanted. Moreover, the music is also insipid and annoying, especially the new theme song. The old arcade game and cartoon had much better music than this. One more thing about the audio/visuals: The presentation in this game is incredibly lame. The menus are not very eye-catching, and the sound effects used in them are irritating. Minor nitpicks, but it could\'ve been better with just a few tweaks. As for the gameplay, this is a straight, no-frills beat \'em up. You must mash the attack buttons to defeat enemies, then move on. Later, you face a boss character, which you must defeat by mashing the buttons faster. That said, the controls are pretty solid: the left thumbstick moves your character around, the A and X buttons attack, Y throws shuriken, B jumps, the L trigger dashes, and the R trigger pops an opponent into the air. The only thing that is not responsive is the cumbersome jumping attack. Airborne enemies move very quickly, so they can easily dodge your jumping strike, and when you\'re fighting a bunch of them at once, that\'s a major problem. Other than that, though, the controls are slightly more responsive than Batman: Rise of Sin Tzu\'s, even though the overall gameplay is as repetitive. There is very little to be concerned about in this game. The dialogue in the game is typical cartoon fluff, but at least there\'s no bad language or sexual innuendo in it. The only thing I can think of that may concern some people is the violence, which is, in fact, mild. The bottom line is that Konami made a good game for a general audience, especially children and the young at heart. Whether people appreciate it or get bored with it is another story. In the end, this is a decent game that could\'ve been better. I just couldn\'t help getting bored with it as I played through, even though it\'s very similar to the arcade game I loved so much. It just doesn\'t have the personality that game did (nor does it have the outrageously funny boss characters like Bebop and Rocksteady, the two mutated Foot Clan soldiers), nor does it have the same frenetic pace. Of course, it\'s not as bad as some of the \'game journalists\' said it was, but, sadly, it\'s not the be-all, end-all of TMNTgames like I hoped it would be. If you\'re interested, I\'d suggest that you pick it up for a nice, low price. I wouldn\'t spend fifty bucks on it, though.